EP059: It’s the half-hour creature feature series, MONSTERS (1988-1991)! EP050: It’s the TV TERROR Book Club! EP038: Bill Bixby stars in The Incredible Hulk (1978). EP033: Would you believe?…it’s Get Smart, House of Max (1970)! EP028: Kolchak is on the trail of THE NIGHT STRANGLER (1973)…. EP026: It’s the now-classic Romero series, TALES FROM THE DARKSIDE (1983-88). EP025: We kick off Season Two with STEPHEN KING’s IT (1990). EP024: Dan Curtis’ DRACULA (1973), starring Jack Palance. EP023: Ghosts and Demons bring double-trouble to THE HAUNTED (1991). EP022: The infamous M*A*S*H episode, “Dreams” (1980). EP021: It was the traumatizer of the decade. It was THE DAY AFTER (1983). EP020: She stalks the night in search of blood. Her name?… DESIRE, THE VAMPIRE (1982). EP019: The Ouija board is a channel of malevolence for Kathleen Beller in DEADLY MESSAGES (1985). EP018: Forget Mary Ingalls…Melissa Sue Anderson is a witch on wheels in MIDNIGHT OFFERINGS (1981). EP017: It’s a witch’s brew of an 80s telefilm with BAY COVEN, starring Pamela Sue Martin and Tim Matheson. EP016: The Bradys fall under the curse of an ancient Hawaiian idol, the TABU. EP015: Before JAWS, Spielberg directed his first feature with 1971’s DUEL. EP014: There’s no such thing as a good night’s sleep in THE DEADLY DREAM (1971). EP013: It’s A Goolies Get Together! EP012: Andy Griffith will hunt you down and kill you in SAVAGES (1974)! EP009: The President’s Plane is Missing (1973). EP008: Hop a flight on the high-altitude hair-raiser, Rod Serling’s THE DOOMSDAY FLIGHT (1966). EP007: The chase is afoot with 1973’s SHE CRIED MURDER! EP005: We get lost at sea with THE LAST SURVIVORS (1975). EP004: It’s a Bigfoot, It’s a Yeti, it’s…it’s a SNOWBEAST! EP003: The Legend of Lizzie Borden / Axe me your questions! 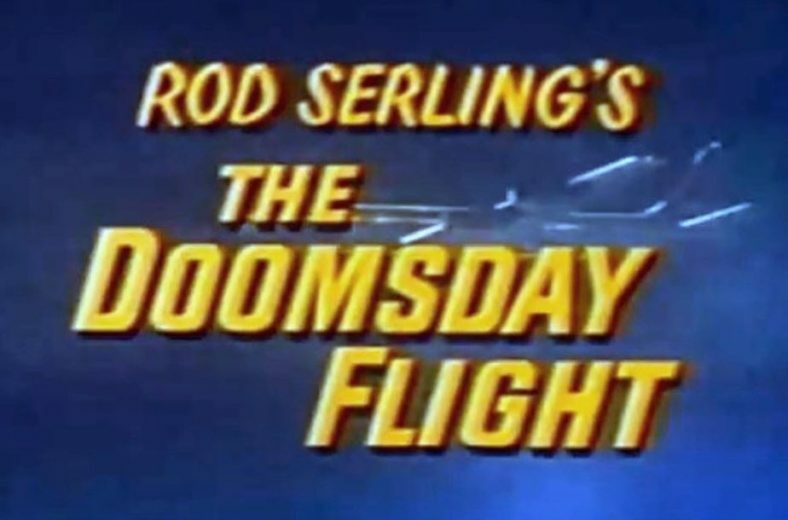 It’s a film Rod Serling regretted writing: the criminally unknown TV Movie from 1966, The Doomsday Flight, starring Jack Lord and Edmond O’Brien. I remember my Dad recording this off of TBS back when cable was only 12 channels. I saw it as a kid around the same time I was first exposed to the original Airport, as well as the three sequels to follow (probably also on TBS). As a result, in my head, I’d often get Airport and The Doomsday Flight confused in one way or another. But I always remembered TDF it was about altitude. Such great stuff. Always a fan of aviation films (my Dad worked in Air Traffic Control), I’m also a fan of less endearing (and enduring) TV movie fare as SST: Death Flight (1977) and Starflight (1983, Lee Majors). As always, you need to balance the good with the bad, I suppose? Great work on the Podcast, looking forward to more!